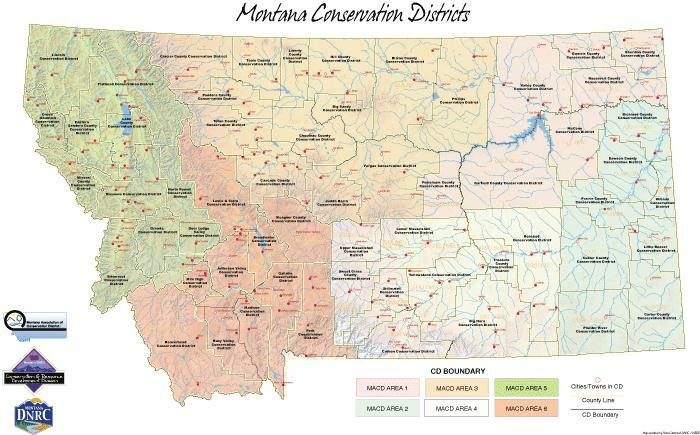 The Conservation Districts Bureau (CDB) provides financial, legal and technical assistance, and training to Montana's 58 conservation districts. The CDB assists conservation districts in meeting their legal requirements to carry out conservation programs locally, assists with the Montana Natural Streambed and Land Preservation Act (310 Permits), assists the Montana Grass Commission with their service to grazing districts, and administers the Rangeland Resources Program. The CDB offers many grant programs for conservation districts, helps sponsor statewide educational events such as the Montana Youth Range Camp and the Montana Envirothon, and also works with groups including the Montana Salinity Control Association, Yellowstone River Conservation Districts Council, and the Missouri River Conservation Districts Council. How Do I Contact My local Conservation District? In the early 1930's, along with the greatest depression this nation ever experienced, came an equally unparalleled ecological disaster known as the Dust Bowl. Following a severe and sustained drought in the Great Plains, the region's soil began to erode and blow away; creating huge black dust storms that blotted out the sun and swallowed the countryside. On Capitol Hill, while testifying about the erosion problem, soil scientist Hugh Hammond Bennett threw back the curtains to reveal a sky blackened by dust. Congress unanimously passed legislation declaring soil and water conservation a national policy and priority. Since about three-fourths of the continental United States is privately owned, Congress realized that only active, voluntary support from landowners would guarantee the success of conservation work on private land. In 1937, President Roosevelt wrote the governors of all the states recommending legislation that would allow local landowners to form soil conservation districts. The first conservation districts formed in Sheridan and Wibaux Counties in 1939 and today, most land in Montana is within a boundary of one of our 58 conservation districts. Conservation districts are political subdivisions with broad power and authority under the law to carry out programs that conserve soil and water, protect streams and rivers, improve soil health, as well as improve wildlife habitat, improve the tax base, and protect the health, safety and welfare of the citizens of the state. Conservation districts are governed by a non-paid, nonpartisan board of elected supervisors. If a city falls within a conservation district boundary, two supervisors are appointed by the city government to represent urban interests. Funding for operations comes from a small tax levied on real property within the boundaries of the conservation district. The revenue from the mill levy varies from $2,500 in less populated counties to over $200,000 in counties with a greater population base. The majority of conservation district levies generate under $25,000 in revenue. This funding is inadequate to meet the goals of conservation districts, so they rely heavily on grants and other creative funding sources. To find out more about your local conservation district and the programs they offer or to find out how to serve, contact them directly using the links above. What Do Conservation Districts Do? The Natural Streambed and Land Preservation Act, also known as "The 310 Law", is administered by the conservation districts. The purpose of the law is to keep rivers and streams in as natural or existing condition as possible, to minimize sedimentation and to recognize beneficial uses. Any individual or corporation proposing construction in a perennial stream, must apply for a 310 permit through the local conservation district. Conservation districts in Montana are able to reserve water for future beneficial use. Currently, 31 conservation districts hold water reservations throughout the Yellowstone, Little Missouri, and Missouri River basins. Each of these conservation districts administers its reservation for use by individuals within the district. Applications for reserved water use can be obtained from the applicable conservation district. • Sponsoring youth conservation field days and annual camps including Natural Resource Youth Camp, Montana Youth Range Camp, Montana Range Days and Montana Envirothon. Conservation district supervisors in 33 counties make up the membership of the Montana Salinity Control Association. This internationally recognized organization headquartered in Conrad, Montana provides expert technical assistance in the reclamation and control of saline seeps in agricultural areas. What is a saline seep? You may have seen white, powdery-looking spots in the low areas of fields. These spots are seeps, and they have adverse effects on water quality, wildlife, agriculture production, and other resources. In addition, many conservation districts sell trees for conservation plantings, provide landowner maps, and provide a host of other services for conservation purposes. Watershed groups are locally led and work on local and regional natural resource management issues on a river basin or watershed basis. Conservation districts are often instrumental on drawing people and resources together to assist the development of these groups. With the rapid increase in subdivided acreages, and the resource issues associated with these small tracts, conservation districts have recently taken on a new role. Conservation districts may operate recycling programs, create and maintain interpretive trails, sponsor water projects, or provide education in natural resource management in an urban setting. Conservation districts promote voluntary, education and incentive-based approaches to conservation. Planning and local input is an important aspect to this approach. Many projects throughout the state are undertaken to demonstrate the latest methods of riparian management, soil health improvements, water quality improvements, river and stream restoration, irrigation efficiencies, and range management. In addition, conservation districts host local conservation education events on the latest farming practices, urban conservation, weed control, and other current topics.